What makes a piece of music feel relaxing? Music is often most affecting when a performance is so natural, and a composition so well-crafted, that a listener is able to let go and relax into a state of pure experience. But what is it that allows music to bestow this state upon a listener? Is music most relaxing when it is at its most simple? Are solo piano pieces inherently more intimate and immediate than a full symphony? Perhaps there's no hard-and-fast rule, but instead an interlocking set of factors that makes a concert-going experience really special. What follows are contrasting narratives of experiencing two different pieces that invoke a strong sense of peace when I hear them performed. The first piece exists at the far end of the spectrum of musical complexity but is written for a single performer on a single instrument. The second piece makes use of a full Romantic orchestra but exhibits a simplicity of style, atmosphere and construction. Fingers lightly approach the keyboard, stretching out to the repeated notes and trill that signal the beginning of the founding "Aria" theme of Bach's Goldberg Variations. The clear, unified resonance of the modern piano ringing out the musical machinations of a genius German Kapellmeister, nearly 300 years behind us. You relax in your seat, positioned perfectly to the left of the stage so that you get a clear view of the pianist's hands as she navigates through the interwoven melodies and intricate harmonic twists that trace the familiar lines of the landmark composition. As time passes, your mind fades into a sublime haze, passively receiving a network of feelings and emotions conjured up by vague cross-relations that feel truer than any concrete memory that you might engage with in a natural state. Even as our pianist barrels her way through Bach's increasingly complex canons, your relaxation deepens with the consistent timbre of the piano ringing in your ears. The instrument itself acts as a guiding agent through the journey, the familiar face that shapes your experience and fosters a sense of consistency and comfort ensuring that the composer's adventurous variations never feel foreign to your new enraptured state of being. The simple interplay between the piano and pianist weaves a cocoon of sound that envelops you, creating an atmosphere that is brought to vibrant life through the complexity of Bach's flurries of notes, fluctuations of tempo, and flexibility of style. Over an hour later, the pianist returns to the very same sonorities that triggered this light and blissful release of emotion, signaling a soft and smooth transition to the chaotic, constant and unguided change of your waking life. Passing through the threshold of Orchestra Hall, the frantic activity of Nicollet Mall receding to from active reality to irrelevant memory, you fid your way to your seat. 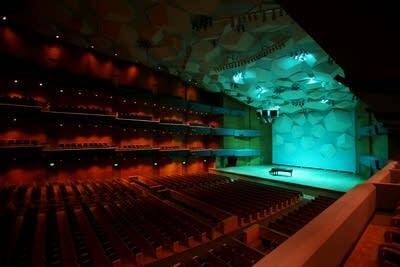 You bask in the anticipation of a performance of Sibelius's seventh symphony as performed by Minnesota's own creative superteam of Osmo Vanska and the Minnesota Orchestra. You imagine the possibilities as performer after performer files onto the stage, spreading out to take their seats alongside an army of like-minded musical masters. Vanska takes the stage, unfazed by the audience's raucous applause. As silence descends upon the hall, you sense the deep creative connection among the musicians onstage as Osmo calls the strings to unveil the staircase to Sibelius's lush musical landscape; a slow, rising modal scale, just one pitch different from the expected major scale, creating an immediate sense of mystery and wonder that is complemented by Sibelius's intensification of the orchestration. Winds billow into the texture like clouds, establishing a ghostly atmosphere, then swirling to life with simple, delicate melodies before receding once more into the background to lend importance to the ascending intensity of the strings. The music unfolds slowly, Sibelius's meticulous orchestration and intricate instrumental interplay lending strength and immediacy to his simple rhythms and unified melodic ideas. The single-movement, 20-minute symphony sounds as one connected thought, one measured climb. The beauty of Sibelius's writing and the mastery of the Minnesota Orchestra wash over you. The first earth-shattering crescendo forces you to close your eyes, and your mind strives to leave the hall altogether, rising with the music above the clouds and into a realm of clear emptiness that lies beyond our waking imaginations. Vanska guides your ascent and the orchestra follows, the culmination signaled by a shift in timbre as the trombone intones a triumphant and regal welcoming call and the strings decrescendo and hold still, opening a sonic space for this new sound, this new agent to deepen your immersion and connection to Sibelius's unique sound world. You're subsumed fully in the moment, in the music and joined to the movements and breath of more than fifty performers. Nicollet Mall is in a different country, your home might as well be on a different planet, and your workplace and responsibilities exist in another galaxy entirely. You have arrived. To me, relaxation exists at an intersection between complexity and simplicity. The singularity and focus of Sibelius's final symphony create the perfect outlet for the intricacy inherent in an orchestral composition. On the other hand, simplicity of timbre and direct performer-to-audience communication is powerfully represented by Bach's complex and varied compositional prowess. What do you think? Are you most pulled in by music that is simple, or complex? Do you also find that a combination of such factors is necessary? What are the pieces that really get under your skin and enable the the kind of relaxing trance that makes certain music so special, and why do you think such pieces are so effective? Sam Tygiel is a composer, flutist and classical music enthusiast currently living in Minneapolis. He works for the Saint Paul Chamber Orchestra ticket office and plays flute and guitar for local rock band Maeth.